There are many things that change when you have multiple cats rather than just one. You need more cat food, you have more litter boxes to care for, and you must provide numerous acceptable scratching surfaces. Cats scratch to exercise muscles and tendons, shed the outer layers of their dull nails to uncover new sharp surfaces, relieve stress, and mark territory. The more cats you have in your home, the more the last two items on the list figure into the equation. Multiple cats might experience more stress over shared resources, and that might make them want to scratch more to mark their territory. It makes cats feel more secure to mark their space. It also helps them "blow off steam" so they are less likely to engage in other undesirable behaviors in the home. This is mine, all MINE! Most types of wild cats don't hang out together very much. They are mainly solitary hunters that come together only rarely. In fact, there may be trouble between wild cats when one feels like another is honing on in his resources. Space, both at floor-level and up high. Attention and play time with their humans. If an indoor cat feels as though he does not have adequate access to any of these things, he may act out by scratching inappropriately, urine marking, or becoming aggressive to other cats, dogs, or humans in the home. I might share, but this Mondo™ is still mine! As we've just learned, one key to ensuring that your multiple cat household remains harmonious is providing enough resources for all of your cats. Make sure you are spending time playing with and cuddling each cat daily. You should have multiple accessible feeding and watering stations. Litter boxes that are kept clean should be available on every floor of your home. The same goes for scratching posts and pads. Every floor of your home should contain scratching surfaces for your cats. How many you need depends on the number of cats in the home and how heavily they like to scratch. A second key to a happy cat scratching environment is variety. It's important to provide several types of scratching posts and pads. Cats like to scratch in different positions. It works different muscles and combats boredom. The positions in which cats like to scratch include: vertically, horizontally, and at an angle. Tall, sturdy, vertical posts. Posts with a bed on top are a bonus. Cat condos. 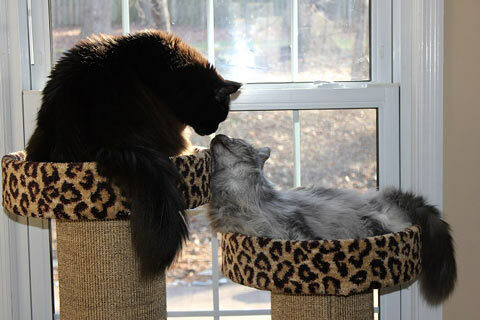 Those with platforms at varying heights, especially ones with beds on top, are coveted spots for cats to climb, jockey with each other for position, cuddle together, and survey their domains. Putting a perch like this in front of a window is always a great idea, too. Cats love to feel like they're part of the action outside without missing anything that's going on inside. Angle scratchers. 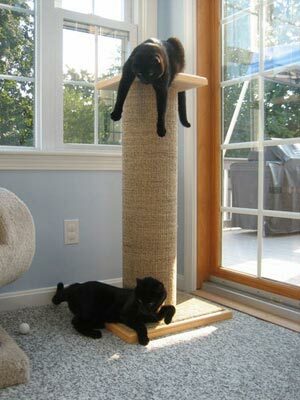 These are great for placing in out-of-the-way spots that cats might like to scratch but where a tall post won't fit. They also work well placed at the base of tall scratchers, so your kitty has multiple choices available at once. 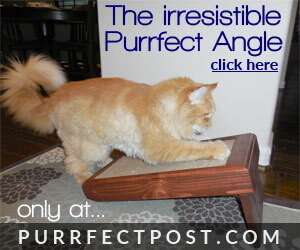 Angle scratchers that can double as horizontal scratchers by removing a leg are versatile and allow you to change things up for your cats periodically. The cardboard inserts of angle scratchers also work great for "hiding" under beds and in closets so your cat can discover them and have a scratch. Don't forget, cats won't necessarily travel too far around the house looking for a scratcher when they want one. And if there are multiple cats in your home, this situation becomes of even more concern because other cats may be using the posts when one wants to use them. Be sure you have scratchers on every level and in every area of your home. Take a look at our article "Why Some Cats Scratch Belongings in Certain Areas of the Home" for more detailed information. Near feeding and watering stations. Close to favorite sleeping areas. In high-traffic areas of the home. 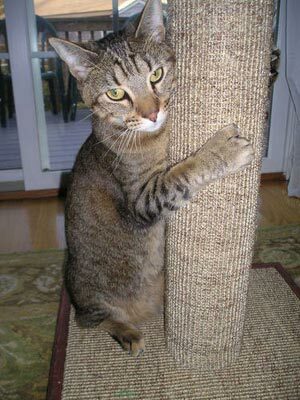 "How to Train Your Cat or Kitten to Use a Scratching Post" contains more information on the best locations for placing scratchers and why. If you have multiple cats, spend some time thinking about how many scratching posts you have, whether they have the qualities that cats need, and where they are. 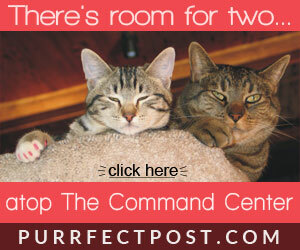 It will keep your cats happy, your household harmonious, and it just may save you and your belongings some trouble.